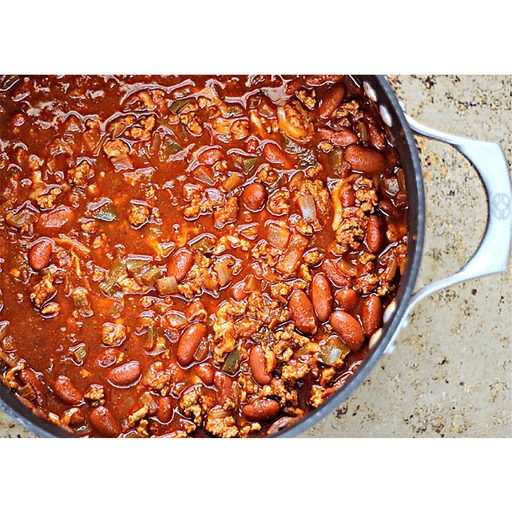 This 8-Ingredient Chili recipe features just 8 classic ingredients that we typically have at home and can be ready to eat in a matter of minutes. 1. Heat oil in a stock pot to medium-high heat. Add onion and bell pepper and sauté until starting to brown, about 3-4 minutes. Add the turkey and cook until browned, stirring often. Season with chili powder and cumin. 1. Add the vegetable juice and beans to the saucepan and heat to a boil. Reduce the heat to low. Cover and cook for 15 minutes. Taste and season with salt and pepper. Swap out the ground turkey for ground beef or Festy Blended Best Yet Ground Beef. Calories 290, Total Fat 9g (Saturated 2g, Trans 0g), Cholesterol 50mg, Sodium 390mg, Total Carbohydrate 30g (Dietary Fiber 9g, Sugars 5g), Protein 23g, Vitamin A 30%, Vitamin C 70%, Calcium 10%, Iron 20% *Nutritional values are an approximation. Actual nutritional values may vary due to preparation techniques, variations related to suppliers, regional and seasonal differences, or rounding.